From left are Elyse Sabin, Leah Freeman, Charlie Krull, Jake Wilkinson, Jackson Templin and Adam Beer. 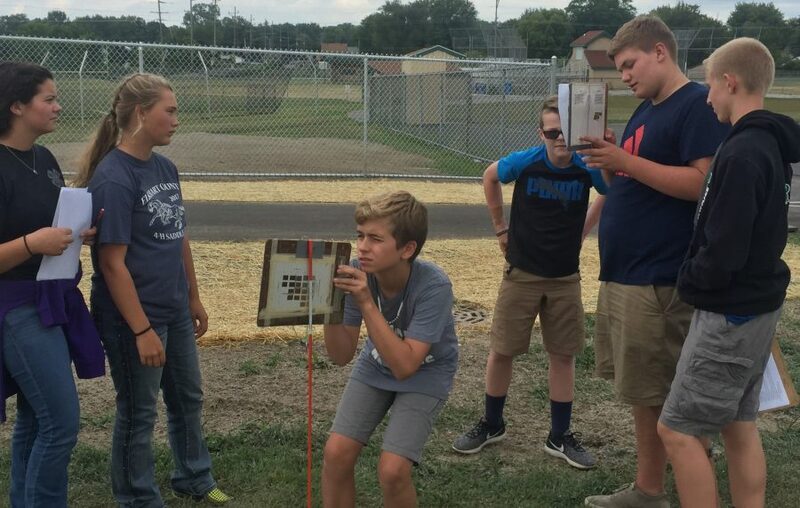 The four students to the left are middle school students in FFA getting tips from high school students on how to use a slope finder to determine the slope. SYRACUSE — Middle school students interested in learning more about natural resources, how plants and animals work together, food science, food safety and more agriculture related topics can now get a head start. Because an agriculture class is now being taught at a middle school in the Wawasee district, middle school students are allowed to join the high school FFA. Mariah Roberts, high school agriscience and business teacher, as well as FFA advisor, noted FFA policy requires an ag class to be taught at the middle school level in order for middle school students to join FFA. She said in years past, middle school students were connected to FFA through 4-H, but on a more limited basis. Beginning with the start of the 2017-18 school year, Roberts began teaching an agriscience class to eighth-graders at Milford Middle School. Those in the class can earn two high school credits. She uses the curriculum for agricultural science education, or CASE. “They (students) learn by discovery with materials and it is very hands-on curriculum,” Roberts said. The broad scope of agriculture is covered including food science and safety, natural resources, how plants and animals work together and more. An agriculture class for middle school students had been discussed for a while but scheduling was an obstacle. Middle school and high school schedules are not the same and the schedule had to be adjusted to allow Roberts to go from the high school to teach everyday at Milford. Allowing middle school students to join FFA should be a positive step. “Kids will learn the content of judging events at a younger age,” she said. “It should help the teams be more successful.” Students will also be traveling to judging events or other contests and will learn how traveling fits into the overall process. Motivating middle school kids more is another aspect to consider. “It could get some kids more invested in their school community,” Roberts commented. “It will extend their learning,” and give them more reason to study academics. There are 24 middle school students in FFA thus far and most are from Milford. About a half dozen or so are Wawasee Middle School students. They have already participated in a county soils judging contest Tuesday, Sept. 12, and the area soils judging contest is Thursday, Sept. 21, near Claypool. Although the agriscience class is only taught to eighth-graders at Milford, those in grades six through eight at either middle school can join FFA. The number may increase from 24 because some students aren’t interested in soils judging and may join after those contests are finished. Roberts said she would like to have as many middle school students as possible committed to FFA by Oct. 1, but that does not necessarily mean latecomers will be turned away. FFA meetings are held the second Thursday evening of each month. A few other local school districts including Warsaw, Whitko and Fairfield have had middle school students in FFA for a while, she added.